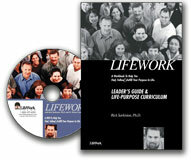 This Leader's Guide shares the same structure as the LifeWork Workbook, covering all 13 chapters plus the LifeWork Discovery Process. Each chapter is designed to be covered in a single group session, creating a 13 part series and a followup session that helps your students find their God-given purpose, follow God's will for them, and fulfill the unique mission God has planned for them. A simple step-by-step approach and weekly DVD introductions allow easy application.